Bush Ticker Man, Les Hiddins. 1996. Major Les Hiddins, better known as The Bush Tucker Man has spent a lifetime travelling through the more isolated parts of Australia, gathering knowledge and tracking down uniquely Australian tales of survival, mystery and courage. 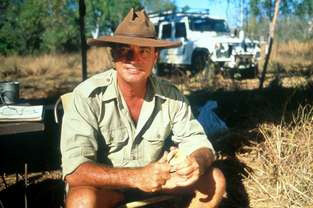 His adventures led to the creation of the extremely popular ABC TV series, The Bush Tucker Man - Stories of Survival. Episode Three, The Great Misadventure first aired on Saturday 22nd June 1996 and focused on the Burke and Wills Expedition. The Great Misadventure: The tale of Burke and Wills is re-evaluated and Les speculates how a knowledge of bush tucker may have changed the outcome of this ill-fated party. TV 1996. DVD release 2004.